Here’s an idea for using rocks as sculptures in gardens and parks. 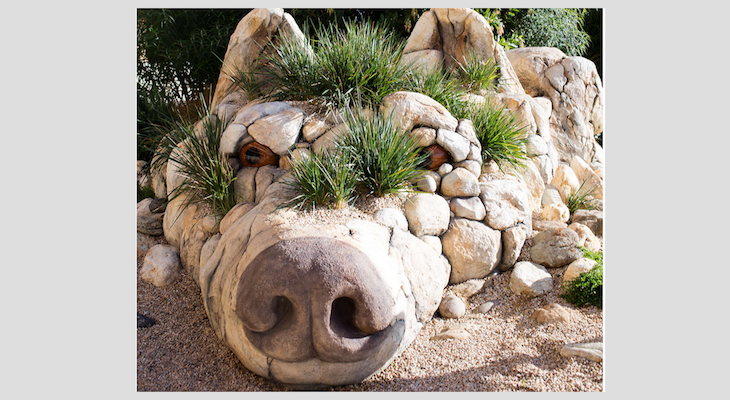 The Gray Wolf rock sculpture at Stanford Children’s Hospital in Palo Alto might give some Montecito landscapers and local artists some ideas! Could something like this be constructed as a memorial to those we lost in the 1/9 Debris Flow? The plants coming out of the rock formation here is a poignant reminder of the passage of time. Art as beautiful as this can mend a broken heart, or many broken hearts. This is lovely and peaceful. The nose and muzzle are most likely painted on, with nice shading to give the impression of depth. The eyes are probably also painted onto the rock. Groovy! Not paint, not rock, faux stone with concrete color. Don't have a clue about the eyes, but the muzzle is concrete and probably has integral color. I expect that concrete stains such as those made by Lithochrome were utilized as well as the integral color in the concrete mix. I love this sculpture and am curious as to how much of it is "faux stone" (concrete). I'd bet that at least the nose and much of the muzzle is concrete. Good idea. Sandstone boulders were a major element of the debris flow. Sculptures could range from a simple plaque in a boulder to the more complex ideas favored by readers. What if the 23 rock sculptures were spread out to different areas. One at lawn of Biltmore, one near Montecito Inn, and the rest in various areas of Montecito, Upper Village, private property in front of wall or gated area, Fire Station, Music Academy, Library, YMCA, on lawn by Tecolote Bookstore, etc. Not all of them together. Maybe there should also be a rock sculpture honoring the pets and wild animals that perished during the 1/9 Debris Flow. I agree one animal and a plaque would be sufficient. 23 would be a little excessive. Rock Sculptures 23 local animals. Each animal would have the name of a person lost in the 1/9 Debris Flow. Example:Wolf..Coyote..Bear..Mountain Lion..Seal..Whale..Shark..Pelican..Great Blue Heron...Flower (honoring old roses at Mission)...Lizard..Bee..Monarch Butterfly..Lady Bug..Hummingbird..Elephant Seal..Otter..Raccoon..Fox..Bobcat..Newt..Trout..Starfish..